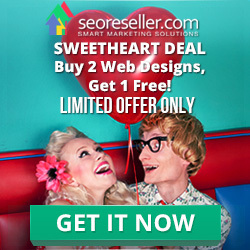 Web Design Package Deal - Buy 2 Take 1! We’re kicking off the month of February with a sweet deal: the first 20 partners who buy 2 web design packages from February 1 to February 28 will get 1 FREE! Website Setup : We will design your logo, choose images for your website, and create homepage mock-ups so you can see how your website will turn out. Development and Implementation : After finalizing your initial layout, we will proceed to develop and implement the actual website. Project Completion : We will push your website live and do QA to make sure everything is in good working order. Add-Ons: If you need additional content creation and on-page optimization, our add-ons have you covered! Whether you need help developing a brand-new website or redesign an existing one, our packages have you covered! You can view a full list of our web development solutions and services here. Remember: this promo is only available to the first 20 customers for the whole month of February. Contact us today and get your discount!